The heat and humidity is starting to become unbearable in Tokyo. One way to survive is to eat hot and spicy food as it induces sweat which helps cool you down. I was meeting a Japanese girlfriend for lunch in Shinjuku and we agreed on Shisen cuisine. Tenfufan in Nishi-Shinjuku has been on my radar for a while because it has an all-you-can-eat suigyōza (boiled dumplings) offer with its set lunch, a bargain as most lunches are under 1,000 JPY. An online website (not the restaurant’s) said the restaurant opened at 11 a.m. We showed up at 11:15 a.m. and were surprised to see a sign on the outside of the shop that said lunch starts at 11:30 a.m. I pushed open the door and the kind owner said that they do not open until 11:30 a.m. but as it was so hot outside that we could be seated early. A pot of iced tea and two cups were set on the table and we started to peruse the menu. The owner said that all set lunches come with the boiled dumplings. He pointed to a small table set off to the side and said that once service starts the dumplings would be there. “Self-service” he added. There is something about growing up in America, at least in the Midwest, that inspires me at a buffet to dig into as much as I can. I was so surprised to see the tables of salarymen near us taking only a few dumplings and not going back for seconds. I stopped after my second visit, but I am sure that had I gone with an American we would have gone back for thirds. 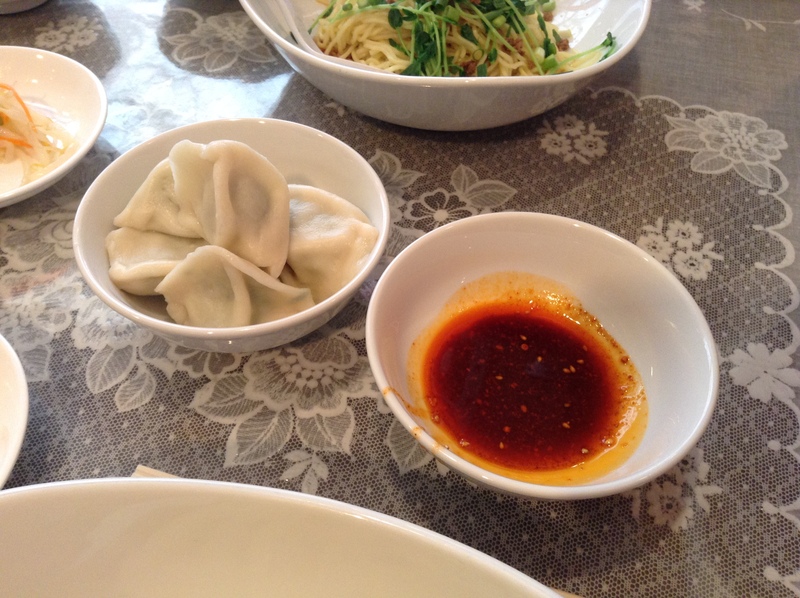 The dumplings are stuffed with meat, the skins seem to be made from scratch, and the spicy dipping sauce hits the spot. Don’t bother with the soy-seasoned eggs that are also on the buffet. 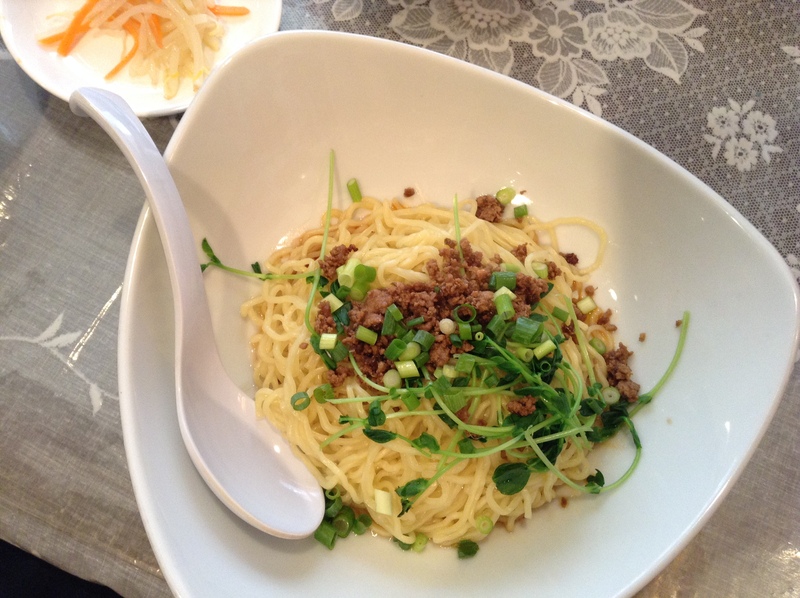 The shiru-nashi tan tan men is one of their signature dishes, along with the suigyōza. Shiru-nashi means without soup. Underneath the ramen noodles were some peanuts and a hot sauce that comes and catches you by surprise after the fact. It’s not too spicy and is rich in umami. The side dishes included a bland fried rice, an unmemorable egg-drop soup, and some bean sprouts with carrots. But who cares when the dumplings and ramen were exactly what we had come for, spicy, delicious, and rich in umami. Shortly before noon the shop was filled. Mostly salarymen who must be working in the area as the shop is on a side street. When we left there was a line out the door. 80% of the diners were having either this dish or the mabo dofu. This meal came to 880 JPY, including the dumplings. I will be back.